Now that Prometheus is out on DVD, we're all rediscovering Ridley Scott's long-awaited return to science fiction. Many people were disappointed with Scott's comeback — but we should have known it would never quite live up to our hopes. Science fiction and fantasy are full of cases of creators who returned to their most famous works after a decade, or even decades, away. Sometimes, these delayed sequels or prequels are terrific, but they're seldom quite the same as the originals. Here's our list of great science fiction and fantasy creators who returned to the works that made them famous after a long delay, of at least a decade. 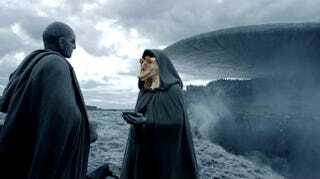 Ridley Scott took 33 years to come back to the universe of Alien, with the don't-call-it-a-prequel movie Prometheus. He apparently enjoyed the experience so much, he's going to make another Prometheus film, plus a sequel to his other great science fiction movie, Blade Runner. Isaac Asimov wrote two books in his Elijah Bailey robot detective series in the 1950s, and then paused until the mid-1980s, before writing two more books in the series. Likewise, he wrote the original Foundation trilogy in the early 1950s, and then came back to write more Foundation novels in the 1980s. Also, towards the very end of his career, he expanded some of his very earliest short stories into novels. As we write here, there's a widespread perception that "Asimov's later additions just don't have quite the vitality and verve that mark the original Foundation Trilogy." Steve Englehart and Marshall Rogers obviously didn't create Batman, but they did create one of the most memorable versions of the character in the 1970s, in a run that's mostly been collected into the Strange Apparitions trade. They didn't return to Batman again until 2005, with the miniseries Dark Detective. Similarly, classic 1970s artist Neal Adams finally returned to Batman recently. Frank Miller created his iconic The Dark Knight Returns in 1986 and didn't publish the sequel, The Dark Knight Strikes Again, until 2001. (Thanks to AngrierGeek, LeftAtMars, and everyone else who brought this one up.) Although, as HeartBurn Kid insists, "There was no sequel to The Dark Knight Returns. THERE. WAS. NO. SEQUEL." Philip José Farmer didn't publish any Riverworld stories for nearly 20 years between the last Riverworld novel and the start of a new series of Riverworld anthologies, featuring stories by a number of authors — including Farmer himself, both under his own name and under a pseudonym. Stephen R. Donaldson had a 21-year gap between the Second Chronicles of Thomas Covenant, ending in 1983, and the Last Chronicles, starting in 2004 with The Runes of the Earth. According to SFSite, Runes is a terrific read once you get past the hundred or so pages of retelling the backstory from the earlier novels. Gene Wolfe published the first two volumes of the Soldier series in 1986 and 1989 respectively, and then published the third volume, the World Fantasy Award-winning Soldier of Sidon, in 2006. So that's only really a gap of 17 years, not "decades," but still worth mentioning in passing. Larry Niven, like Isaac Asimov, made a point of returning to all his classic universes after a long absence. He wrote Ringworld Engineers in 1980 and the third book, Ringworld Throne, in 1996. With Jerry Pournelle, he wrote Inferno in 1976 and the sequel, Escape From Hell, in 2009. Also with Pournelle, Niven wrote The Mote in God's Eye in 1974 and a sequel, The Gripping Hand, in 1993. John Ostrander and Timothy Truman created Grimjack, a brilliant genre-spanning comic that's hard to categorize — it's sort of a noir detective story set in a city that spans all possible dimensions, including fantasy realms. The series appeared from 1984 to 1991, when the publisher went bankrupt — and then we didn't get any more Grimjack until 2006. Poul Anderson published Operation Chaos in 1971 and the sequel, Operation Luna, in 1999. These novels, taking place in an alternate World War II where magic has been industrialized and a werewolf movie star is drafted to become a spy, were eventually collected into a single omnibus. Also, the Hoka trilogy, which Anderson wrote with Gordon R. Dickson, was published in 1957, 1975 and 1983, making for a pretty huge gap between the first and second books. C.J. Cherryh published Cyteen in 1989 and the followup, Regenesis, just a few years ago. As Cherryh told SF Signal, "Betsy Wollheim has been patiently waiting for that one for a long while. I had to move north, de-stress my life, and get things organized before I could undertake it-and was amazed to realize how long it had been since Cyteen. Young readers have become parents while waiting for that book." Peter S. Beagle published The Last Unicorn in 1968 and only recently published a sequel novella, "Two Hearts" — thanks to Lightning Louie for the suggestion! Walter Miller wrote A Canticle for Leibowitz, and then 33 years later released a sequel — but it was actually finished by Terry Bisson, based on Miller's notes. (Thanks to everyone who brought this up! Arthur C. Clarke only let 14 years lapse between 2001: A Space Odyssey in 1968 and 2010: Odyssey Two in 1982, but it seemed worth mentioning anyway. Ursula K. Le Guin wrote the original Earthsea trilogy in the late 1960s and early 1970s, and then nearly two decades passed until she wrote a fourth volume, Tehanu. (I read all four books back to back for the first time, and didn't really notice much difference between the first three and the fourth.) Then, she returned to the series again in 2001 for a short story collection and a final novel, The Other Wind. William Peter Blatty wrote the screenplay to The Exorcist, based on his own novel, in 1973. And then he wrote and directed a sequel, The Exorcist III: Legion, in 1990. He ignored the events of The Exorcist II, which was largely regarded as a ludicrous cash grab by the studio, and just made a direct sequel to his own original film, after just a 17-year gap. Anne McCaffrey only waited about 17 years between her book To Ride Pegasus and the follow-ups, Pegasus in Flight and Pegasus in Space. But she also turned her 1959 short story "Lady in the Tower" into a 1990 novel The Rowan, which is a much longer gap. And similarly, her 1969 short story "A Meeting of Minds" became her 1991 novel Damia. George Lucas And last but not least... the Star Wars universe continued after Return of the Jedi, but George Lucas didn't touch it for around 16 years, until he returned with The Phantom Menace and two more prequels. These films, especially Phantom Menace, tend to arouse strong opinions among fans and film critics — making the reaction to Prometheus feel like a simultaneous worldwide standing ovation by comparison. Thanks to Danny for all the help!